Professors McGough and Weiss; Associate Professors Pyeatt and Qiao; Assistant Professors Karlsson, Hinker, and Rebenitsch; Lecturer Schrader; Emerita Professor Logar; Emeritus Professors Carda, Corwin, Opp, and Weger. The primary goal of the computer science program is to prepare graduates to enter a dynamic and rapidly changing field as competent computer scientists. Graduates are expected to be capable in all phases of software development including design, development, and testing. Graduates should also have a firm understanding of hardware technologies. These capabilities require the graduate to possess good communication skills, both oral and written, and the ability to work effectively as a team member. Graduates must be able to read and comprehend the literature of the discipline and be sufficiently well-versed in general theory to allow growth within the discipline as it advances. Most of the graduates will pursue careers as software engineers within the computer industry. Some may choose careers as entrepreneurs and others will pursue advanced degrees and careers in research. The accompanying sample schedule lists all required classes for the degree in their proper prerequisite sequence. Students should consult course listings for prerequisites and should consult their advisors at each registration. A computer science major must complete a minimum of 15 credits in humanities and social science, with at least 6 credit hours in humanities and at least 6 credit hours in social science. Refer to the humanities and social sciences section of this catalog for a list of courses satisfying these requirements. It is also important to refer to the general education core requirements under bachelor of science graduation requirements for further information. Students must complete the general education core requirements within the first 64 credits. Any computer science major desiring a minor in another field should consult his or her advisor in the Department of Mathematics and Computer Science as early in his or her program of study as possible. The Office of the Registrar and Academic Services has a form that must be signed by the student and the department heads of both departments involved. 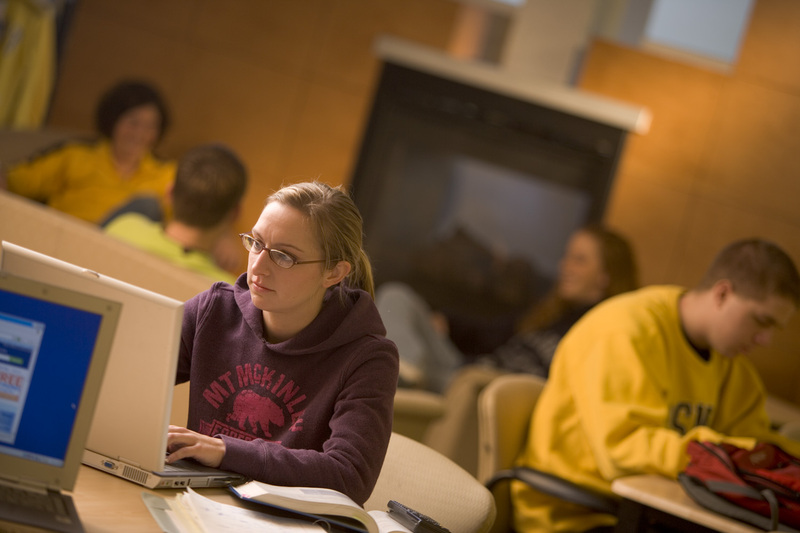 Due to the large number of courses common to the computer science major and the mathematics major, many students find it attractive to pursue a double major in these two areas. Students seeking the double major should consult their advisors for details about this option. The B.S. in Computer Science program has aligned with the M.S. in Computational Sciences and Robotics (CSR) program. The accelerated option allows for students to complete both the B.S. program and the M.S. program in five years. Students interested in this program need to apply to the CSR program before or during their junior year. Students accepted into the program can apply up to ten credits of graduate courses towards their undergraduate degree and these same courses will apply to their graduate program of study. Students should inquire about this program at the department office or contact the CSR program coordinator. Course requirements for the program also include the total number of credits per course. Any student that has an approved course for transfer will fulfill the course requirement, but if the transferred course does not meet the total credit hour requirement then the program committee will decide on the proper accommodation for meeting the total credit hour requirement. Students should consult with their advisor to get clarification on the necessary accommodation. CSC 464 /CSC 465 is a two-course sequence in senior design. It is expected that the course sequence will be taken in successive semesters. An exit exam, such as the Major Field Achievement Test in Computer Science, will be given as part of CSC 465 . The overall results of this exam will be used to assess the computer science program. CHEM 106 , CSC 105 , MATH 021 , MATH 101 , MATH 102 , MATH 120 , PHYS 111 , and PHYS 113 may not be counted towards the Computer Science degree. 1 Elective courses must be chosen to satisfy all of the following requirements. Fifteen semester hours in humanities or social science. At least 6 hours must be in humanities and at least 6 hours must be in social sciences. Six credit hours of humanities and 6 credit hours of social science must be completed within the first 64 hours. It is important to refer to the general education requirements under bachelor of science graduation requirements for further information. The eleven credit science requirement for this major consists of PHYS 211/211-A and two more lecture courses from among BIOL 151 , BIOL 153 , CHEM 112 , CHEM 114 , GEOL 201 , or PHYS 213/213-A ; plus two labs that accompany the science courses taken, i.e., either BIOL 151L , BIOL 153L , CHEM 112L , CHEM 114L , GEOL 201L , or PHYS 213L . Students must complete science classes from at least two different disciplines. The math elective includes any course from the following list: MATH 321 , MATH 381 , MATH 382 , MATH 413 , MATH 421 , MATH 423 , or MATH 443/543 . 2CSC 251 must be taken for four credits to apply towards the Computer Science major.